When I think of sage (or smell it) I always think of turkey stuffing.Funny how smells can bring back all kinds of memories and when I was growing up, the sage bottle only came out on Thanksgiving. I’ve been growing sage for many years now and we always have more that we can use just at Thanksgiving so I’ve learned to use it for other things too. Sage is a member of the Salvia genus and there are over 900 varieties of Salvia, not all of them are edible. We usually say sage when we’re talking about the edible plants and salvia when were talking about the ornamental plants in this genus. 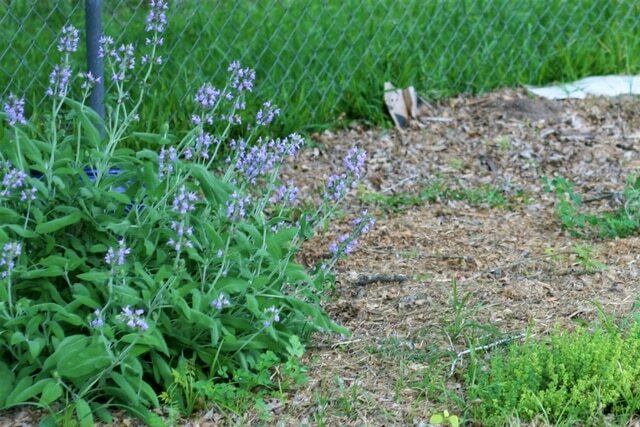 Sage or salvia grows very well here and we use ornamental salvia in drought tolerant landscaping. It’s beautiful and the bees love it. For culinary and medicinal uses we grow common sage also known as garden sage and kitchen sage. White sage is a very popular medicinal plant. And pineapple sage with it’s bright red flowers is another fun sage to grow. Bees love all of these sage plants, so don’t be afraid to let them flower. If you live in gardening zones 5-8 sage will grow as a perennial. If you live where it gets really cold or really hot it will probably be an annual. However, we live in zone 9 along the Texas Gulf Coast and by planting the sage where it can get some shade and relief from the heat we can grow it as a perennial. That’s the thing about living where summers are long and hot, when plant descriptions say “full sun”, they don’t really mean South Texas full sun or Arizona full sun. That’s why it’s really important to know and understand your growing environment. If you need help understanding your climate, we have a short ecourse to help you out. Sage likes well drained, sandy soil and doesn’t like a lot of water. Therefore, growing sage in pots is a good idea if you’re short on garden space. Sage makes a good companion plant to carrots, cabbage, tomatoes and strawberries. These worksheets are great for figuring out how much to plant to feed your family. Just fill in the form below and they’ll be emailed to you. Sage doesn’t propagate well from seeds so when you’re starting out, it’s best to just buy a small plant. You only need one plant as you can easily grow sage from cuttings as the plant grows. To grow sage from cuttings, cut about 6″ of a green stem (not a woody stem), dip it in rooting hormone and put it in a pot of vermiculite. Once roots form, you can plant it in regular soil. This takes several weeks so don’t get discouraged. Another way to propagate sage from cuttings is to do it right in the garden bed, this is the way I do it. Bend a large stem down to the ground and secure it about 4″ away from the tip so the stem is touching the ground in one spot.. You can use gardening pins or a small rock. The sage will re-root itself over time. Once it’s rooted, you can clip it away from the mother plant. If you want to grow it somewhere else, you can dig it up and move it. There really isn’t much to say about harvesting sage, it’s one herb that you can just harvest as you need it. Like other herbs, it’s best to harvest sage in the morning after the dew has dried. If you want to do a big cutting, don’t take more than half the plant and don’t do it within two months of your first frost date. You can continue to harvest even after it flowers. The bees love sage flowers so I let the plant flower when it begins to. Most people recommend replacing your sage every 3-4 years, but I’ve found that if I just do the lazy propagation every other year or so, my sage does just fine and I never really have to start over. In the early spring, it’s good to prune the sage plant of some of it’s woody stems and new growth will take place with leaves just as flavorful as the previous year’s leaves. Sage leaves have fuzz on them that makes dirt cling to them. You’ll definitely want to wash the sage before preserving it. I like to use my salad spinner to do this. I put the sage in the basket and put the basket in the bowl and fill it with water. Gently swish the sage around then then let it sit and the dirt will settle to the bottom and larger debris will float on the top. After a about 5 minutes I take the basket out and pour out the water. I do this a few times until there’s no more dirt in the water then I spin the leaves. 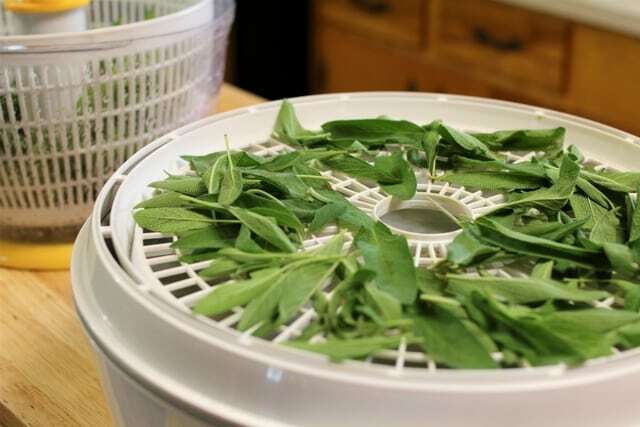 Like other herbs, you can dry sage either by hanging it upside down in small bundles out of direct sunlight or by using a dehydrator. The dehydrator should be set no higher than 95°F. When I bring just a handful of leaves in, I’ll dry the sage by laying it out on a napkin on my kitchen counter out of direct sunlight. In a couple of days the sage leaves are dry. You can also freeze sage by chopping it up and putting it in ice cube trays with a little water. Sage can also be preserved in salt, the salt will extract the water from the sage. And in honey. There are a lot of things you can do with sage that don’t include turkey dressing – but that is one of my favorite things. Sage is also a great addition to homemade sausage and any chicken or pork dish. But sage isn’t just for savory dishes. My family loved the sage cookies in The Herbal Cookery course I took last year. You can also make a gourmet brown butter sage to use as a topping for dishes or make a compound butter. Sage pairs nicely with biscuits and gravy. It also pairs nicely with liver. I’m not a liver eater but these look really good! You can also make an herbal homemade soda with sage. I bet pineapple sage would be great for this. Sage makes a great decongestant and can be infused into honey or added to a homemade cough syrup or throat spray. Traditionally sage has been used to make an oxymel for cold and flu season. While you can use garden sage for this, white sage would also be an excellent choice. It also can be infused into apple cider vinegar to make a face tonic to help with acne. 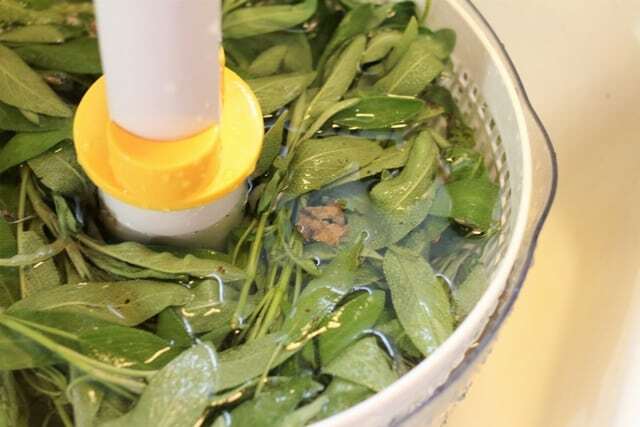 This homemade deodorant spray also looks very promising as sage has antimicrobial properties. Sage is one of those amazing herbs that are easy to grow, taste great and have medicinal properties. 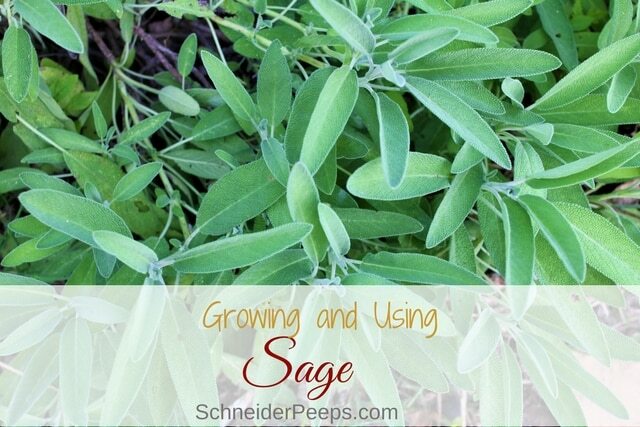 Do you grow sage in your garden? 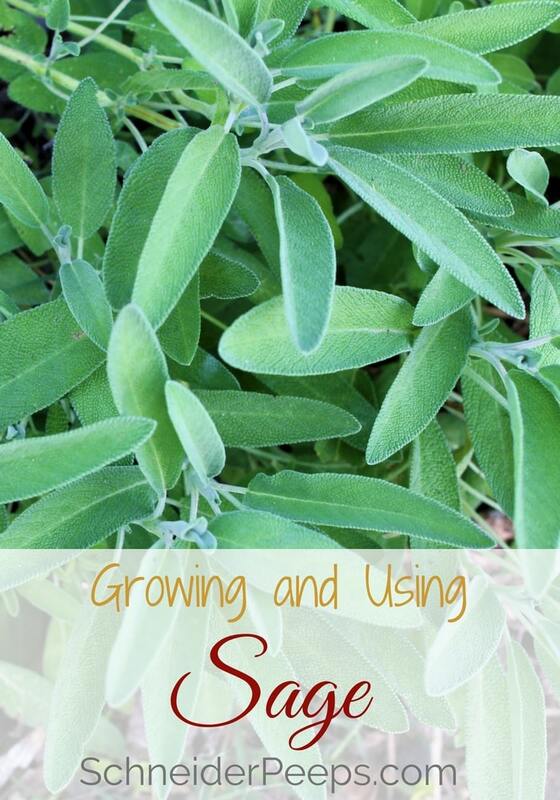 Feel free to share tips for growing sage or using sage in the comments. Sage is a wonderful ingredient to tea. I add it to mint and chamomile. It helps with inflammation. Oh, that sounds lovely! Thanks for sharing. Will it help with hot flashe? Has anybody tried it? Or what herbs would help the best? I’m not quite to that stage of life just yet, but I know it does help some women with hot flashes. Sage makes the best multisurface spray cleaner I have ever used. I clean windows, furniture, floors, and anything else I come across. Soak sage in distilled water for a few days. Add a few tsp alcohol. Strain and put in spray bottle. Your house will smell fantastic too. You can also dry and bundle as potpourri. How great! I bought a sage plant at farmer’s market because I read it keeps mosquitos away. Put some old, dried coffee grounds in a small glass saucer or jar, add a sage leaf or two, and place a tea candle directly into the grounds. It’s a cute, functional, outdoor decoration as well. I have a sage plant in a large pot that I take camping. I set it in the picnic table when we get to the site and it keeps flies and mosquitos away from our eating area! Harvest the perfect large leaves & fry them until crisp ( only a minute at most) & lightly salt. They make a nice accent to salad, soup, or as an edible garnish. Yummy!